Artichokes are the edible, immature flowers of a cultivated thistle that was introduced to America by Italian immigrants who settled in California around the turn of the century. The Italians have been cultivating and refining the artichoke plant for at least two thousand years. Today there are artichokes of all shapes and sizes, and color combinations—green, green and violet, and dark purple. (We grow the delicious green “Imperial Star” and the gorgeously purple-and-thorny “Violetto”. The larger ones can be steamed whole and served with a sauce or vinaigrette, or they can be quartered, stewed and served in a salad. The heart of the artichoke can be sliced very thin and used in a gratin or casserole, or they can be stuffed and baked. The young buds make for especially fine eating, and they can be cooked whole since they haven’t developed their prickly choke. 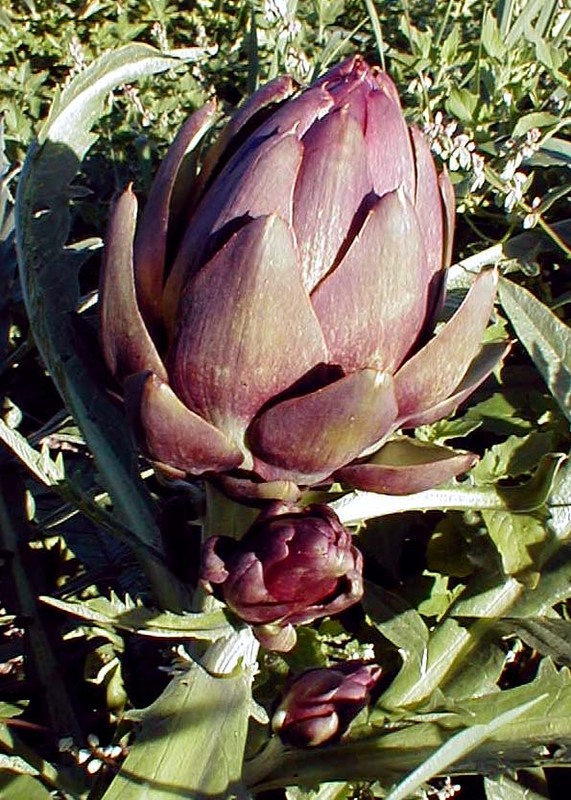 In areas with warm winters, artichokes produce two crops per year: spring and fall. Usually at our farm, if conditions are favorable, Imperial Star will produce in the early fall, and the hardier Violetto produces in the spring. Slice 2-3 hearts of steamed medium artichokes. Heat 1 tbsp. butter in a skillet over medium heat. Add 2 crushed, peeled cloves garlic and cook until fragrant. Remove garlic and add artichokes. Cook, stirring, for 2 minutes, then transfer to a bowl and keep warm. Wipe out skillet, then add 2 tbsp. butter and melt over medium heat. Beat 4 eggs with 1/4 cup cream and 1 tbsp. water. Add eggs to skillet, season with salt and pepper, and cook, folding gently with a spatula, until eggs are set and fluffy. Fold in artichokes, then spoon onto warmed plates. Garnish with finely-chopped parsley and serve. 1. Pull off the tough green outer leaves until you get to the mostly-yellow, tender leaves. Peel stem and slice about 1″ off top of artichoke. Spread open leaves and scoop out fibrous choke, using a spoon. Rub artichokes all over with lemon to prevent browning. 2. Stir together mint, garlic and 2 tsp. salt in a mixing bowl. Pack approximately 2 tbsp. mint mixture between leaves and rub a little in the center of each artichoke. 3. Pour 1/2 cup of oil into a medium saucepan. Place artichokes stem side up in pan and pour wine and remaining oil on top. Cover and cook over medium-low heat until tender (check for tenderness at thickest part of the stem), about 40 minutes. Season to taste with salt and pepper. 4. Move artichokes to platter and cool—they’re best served at room temperature. Continue to cook juices until reduced by half, then serve as a sauce, drizzled over artichokes. 1. Place artichokes, garlic, oil, lemon juice, sugar and 1 cup water in a large skillet. Season to taste with salt, then bring to a boil over medium-high heat. Cover, reduce heat to medium-low, and cook, stirring occasionally, until artichokes are tender, about 45 minutes. 2. Meanwhile, bring a large pot of salted water to a boil over high heat. Add favas and blanch until skins can be easily removed, about 2 minutes. Drain, refresh in cold water, then slip off and discard skins. 3. Add favas to artichokes, increase heat to medium and cook, uncovered, until most of cooking liquid has evaporated, about 5 minutes. Add parsley, season with salt, and serve. Variation: Peel and dice 1 medium carrot. Add with artichokes in step 1, then stir in 1-1/2 cups fresh shelled or frozen peas with favas in step 3.